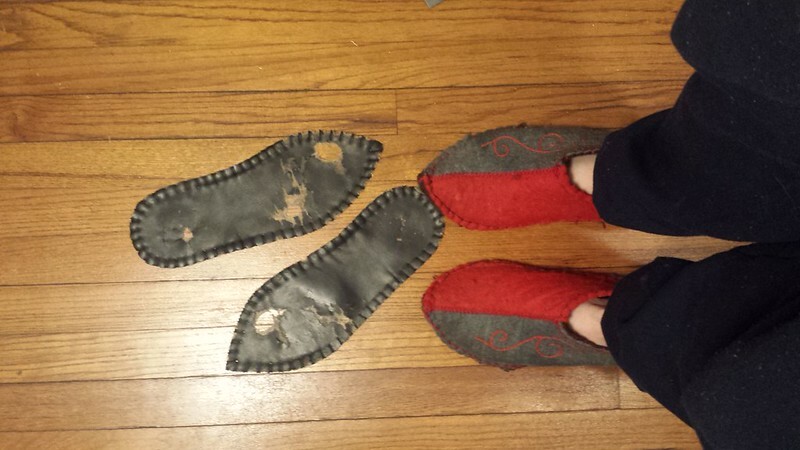 On Saturday I finally had the time and mental capacity to finish the project of refurbishing my slippers. These are slippers that the Snow Leopard Trust used to sell, but they don't seem to carry them anymore. (on the other hand, I will note that the felted mice they still sell are fantastic cat toys) To me this is kind of a shame, because these are the first slippers I've ever owned that came even remotely close to actually keeping my feet warm, and I like the look of them, too. But over time, I loved them so much that I wore holes all the way through the felt and vinyl soles. Instead of throwing all that wool into a landfill and having to hunt and pay for new slippers, I decided to try my hand at refurbishing the old ones instead. Refurbish-ability is an advantage of a handmade item made of mostly natural materials. First, I knitted a new wool layer to sandwich into the sole, and then I cut out a layer of leather for the bottom to replace the worn-out vinyl. Then I took each slipper apart and then tried to stitch the sole layers back together with the upper with a blanket stitch, more or less following the original design. Over the course of the first slipper, I concluded that that was a lot of layers to try and blanket stitch together, so for the second slipper I whip-stitched the inner padding layers together first and then the outer portions. The result isn't as nice and neat as the original, but they're functional slippers again, with more padding, and they are also noticeably warmer than before. 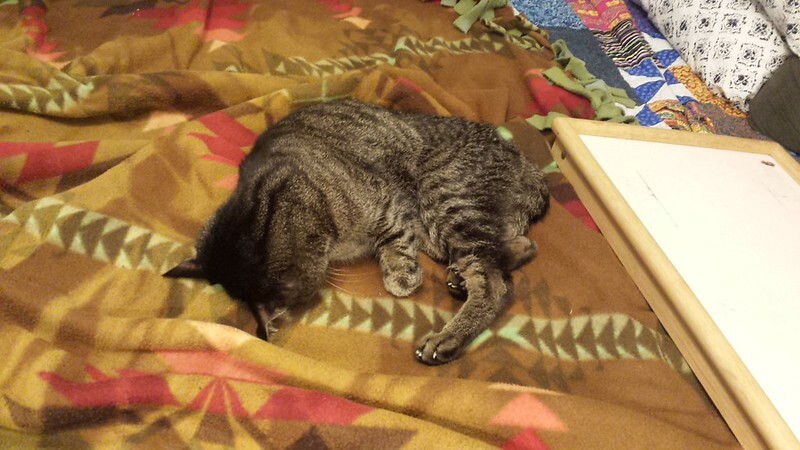 The mending and sewing pile is still very large these days. For instance, I have a pair of warmup pants that I wear almost every single day while winter bike commuting, that date back to college (Tufts crew warmups). Years ago, the elastic waistband failed, and the bottom right leg got snagged on a chainring. I replaced the elastic somewhat clumsily (older sewing machine), and I should really sew a patch over the top of the snagged portion. Then maybe I can get a few more years out of those pants, so long as the exposure to road salt doesn't do them in completely. Meanwhile, my handmade lunchbox is revealing the limits of my sewing abilities, via the presence of some frayed edges and a zipper that came detached. Then there's the wonderful wool jacket that belonged to my grandfather, which needs a new liner, reinforcement at some pocket seams, and more wool at some threadbare spots. One thing at a time, I suppose. I won't even mention the new sewing projects I'm itching to work on (shirts, mostly). Or the knitting ones. This entry was originally posted at https://rebeccmeister.dreamwidth.org/1284452.html. Please comment there using OpenID.